In anticipation of his upcoming conference keynote presentation, Implementing Predictive Analytics at CMS: Lessons Learned and Future Directions at Predictive Analytics World for Government, October 17-20, 2016, we asked Dr. Shantanu Agrawal, Deputy Administrator for Program Integrity and Director of the Center for Program Integrity at the Centers for Medicare & Medicaid Services (CMS), a few questions about his work in predictive analytics. Q: How would you characterize your agency’s current and/or planned use of predictive analytics? What is one specific way in which predictive analytics drives decisions in your agency? CMS designed the FPS to accommodate 4 model types including rule-based, anomaly, and social network analysis models, in addition to predictive models. These model types address multiple kinds of fraud schemes. In addition, they work together to increase the effectiveness of one or more models to identify potential and actual fraudsters. Since June 30, 2011, the FPS has run predictive algorithms and other analytics nationwide on a daily basis against 4.5 million Part A and Part B claims to generate alerts for Program Integrity (PI) purposes. The FPS alerts when egregious, suspect, or aberrant activity is identified, and automatically generates and prioritizes leads for review and investigation by the Agency. 1 Department of Health and Human Services Centers for Medicare & Medicaid Services, MLN Matters, Number SE1133, 2011. A: The FPS “big data” effort has had a profound impact by allowing CMS to quickly identify issues and take action. CMS has saved over $1.5 billion in inappropriate payments since implementing this system, producing a 11:1 return-on-investment in the latest year of operations. There are a number of things an organization has to do well to really drive value from data intensive approaches. First, often disparate data has to be compiled into a single usable structure and technology solution that promoted ease of use and allows business-focused analytics. This can only be done by engaging end users early and promoting the use of data. Second, analytics have to be incorporated into existing business processes. In our case, program staff, policy analysts, and investigators had to be convinced that “big data” would make their work more efficient and effective so that it became part of their usual work-flow, instead of an add-on. Third, the business has to constantly feedback on the analytics to make sure that useful, high yield models are constantly being designed and rolled-out – and where necessary, models and analytical approaches are being improved to provide more actionable results to the business. Finally, you have to establish performance metrics and measure results, to know how “big data” is impacting work and hopefully making it better. Data without a measurable ROI is not necessarily an improvement. Done right, big data leads to more confident decision making, and better decisions can result in greater operational efficiency, cost reduction and reduced risk. For example, the FPS identified a home health agency in Florida that billed for services that were never rendered. As a result, CMS placed the home health agency on prepayment review and payment suspension, referred the agency to law enforcement, and ultimately revoked the agency’s Medicare enrollment. In Texas, the FPS identified an ambulance company submitting claims for non-covered services and services that were not rendered. Medicare revoked the ambulance company’s enrollment. Likewise, FPS identified that an Arizona, medical clinic had questionable billing practices, such as billing excessive units of services per beneficiary per visit. Upon review of medical records, it was discovered that physicians had been delivering repeated and unnecessary neuropathy treatments to beneficiaries. That medical clinic was revoked from Medicare enrollment. A: Now in its fifth year, CMS has begun work to build a new and more robust FPS system (FPS2) that is scheduled to go into production the first quarter of CY 2017. FPS2 will be enhanced to improve predictive analytics by (1) decreasing the time it takes to market and recode models to custom language, (2) expanding the toolset to include Social Network Analysis visualization, (3) improving the user interface based on previous and past user studies, (4) implementing the ability to suspend payments within the tool, and (5) providing an easy to use computer interface, enabling users to access and view claims level data in maps and charts. Ultimately, FPS2 will continue to increase the CMS CPI return on investment noted in the original FPS. 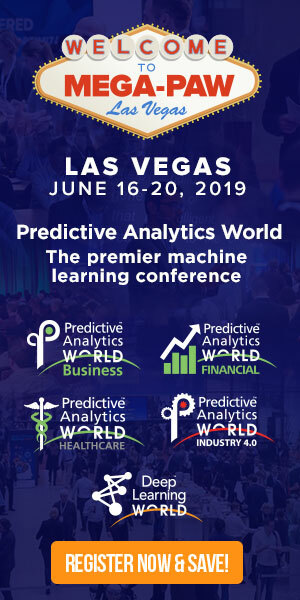 Don’t miss Dr. Agrawal’s conference keynote presentation, Implementing Predictive Analytics at CMS: Lessons Learned and Future Directions on Monday, October 17, 2016 from 1:00 to 1:45 pm at Predictive Analytics World for Government. Click here to register to attend. USE CODE PATIMES16 for 10% off current prices (excludes workshops).